Bride: If it’s all about the dress then fine, it’s your big day! But if you’re planning a budget wedding, take a look at some of the great British high street’s offerings. ASOS has an ever-expanding wedding dress range (see photo below). John Lewis, Debenhams and Monsoon are also worth a look. If you do splash out on your dress, you can bring the cost of your whole outfit down with high street shoes (who really sees the bride’s shoes under the long dress anyway?) and a DIY veil (see this tutorial on making your own veil). Groom: Moss Bros has really upped their game both in hiring men’s suits and in tailoring them. Also check out Next and Topman. Bridesmaids: Head over to your local high street shops for some seriously beautiful bridesmaids dresses for around half the price of your average bridal store. ASOS, Coast and Monsoon have some lovely on-trend and budget friendly options. If you’re feeling brave, check out Ebay for made-to-measure dresses at a fraction of UK prices. Allow plenty of time for them to ship to you and, unless you’re a professional seamstress who knows how to truly measure your bridesmaids (which you’re probably not if you’re ordering dresses), be prepared to have minor alterations when they arrive. Best Man & Ushers: Again, check out the high street hire options. Or, if you’re having a less formal wedding, why not just buy them matching ties and let them wear whatever suits they already have? Flower girls: TX Max has some great discounts on children’s clothes. Also check out Matalan and even supermarkets. Splurge on: your bouquet will be in your memory – and your photos – forever so it might well be worth commissioning a professional florist for your bridal and bridesmaid’s bouquets, and your bridal party buttonholes. Save on: table centrepieces by growing your own or buying flowers from the supermarket and arranging in decorated jars. Consider whether you really need wedding favours – many guests leave them behind anyway. Compromise: Many florists sell DIY flower buckets – they’ll supply the flowers of your choice to suit your colour scheme for you to arrange. 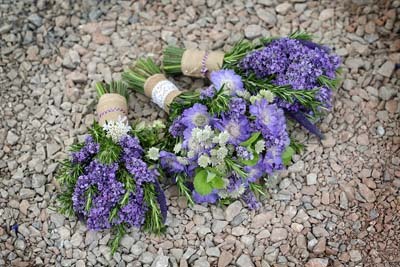 Consider commissioning buttonholes for just the groom, best man and fathers and DIY your own for the ushers. Likewise, if you want to give your guests favours, think about making your own. Your catering doesn’t need to double your wedding budget. Yes, you need to feed your guests. And yes, the food does need to be good. But your menu doesn’t need to be complicated or fancy. Pick a simple menu with quality, seasonal ingredients and everyone, including your wallet, will be happy. Most weddings are early afternoon so the ‘wedding breakfast’ is actually lunch for most of your guests, meaning you need to feed them well again in the evening. Consider having your ceremony later in the afternoon so you only need to feed your guests once if you’re on a tight food budget. If you’re having a wedding cake, consider serving this as pudding instead of paying for a three course meal. And on the subject of cake, do you really need a professionally made, bespoke wedding cake? Waitrose and Marks & Spencer (see photo below) both have some fab, lower cost celebration cake options you can decorate with fresh flowers yourself. You can save a small fortune by choosing a venue that’ll allow you to supply your own wine and bubbly. Just make sure they don’t sting you with corkage charges. If you have picked a venue that’ll let you bring your own booze, pick your preferred wine and fizz well in advance (having a wine tasting evening with both sets of parents is a fun way to all get to know each other better too!) so that you can pick it up when it’s on offer from a supermarket or wine merchant. Majestic’s sale or return service is perfect if you’re not sure how much to order.